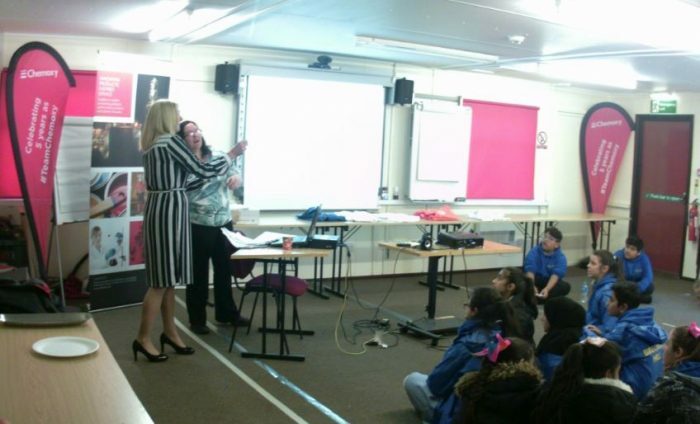 Yesterday Chemoxy has had a visit from Breckon Hill Primary school part of the Children Challenging Industry Project. We had 35 children accompanied by their teachers. Through the visit we explored the theme of Mixing, which naturally tied in well with their ‘Kitchen Concoctions’ science project at school. The site tour along with the tour guides, Control Room Operators, Fork lift truck demonstration, water curtain demonstration, and ‘How to make Gobbledy gloop’ in the R&D lab was particularly popular which showed a polymerisation reaction in a bag by mixing crystals and coloured water! The R&D Chemists also demonstrated how different types of liquids can be separated in to layers based on their density using golden syrup, coloured water and vegetable oil. After their visit round the site the children were shown a short PowerPoint presentation on how we use recipes and equipment such as agitators, tanks, drums and how we mix chemicals to make products for customers and HR spoke about careers@chemoxy .Throughout their we gave them specific information on chemicals and their uses and how their education and hard work will help them be successful in future, along with a quiz for the children about what they saw as they walked around the site. At the end of the visit prizes for the Quiz (Books on science experiments to do at home) were issued to several lucky winners, as well as a Chemoxy good bag which was given to each student. Hopefully we have inspired a new generation of scientists and industrialists with the enthusiasm shown by all involved!